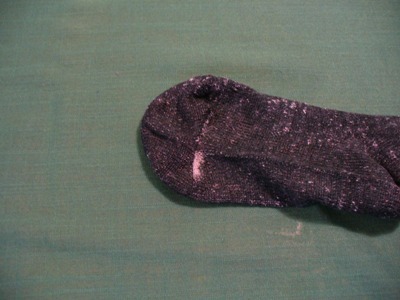 Start with a clean sock. Put it on your hand and talk to it. Does it talk back? If not, proceed to step 2. 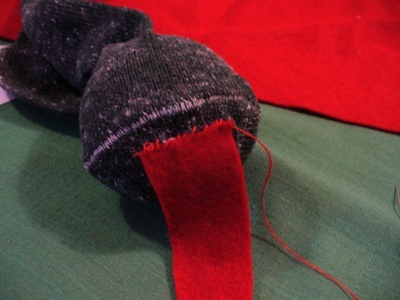 If your sock has a major hole, let it know you care by sewing up the hole. 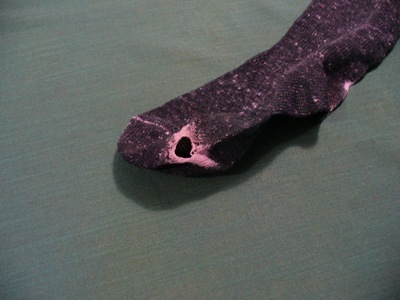 Working with the sock inside out lets the repair almost disappear. Print out the pattern shapes or draw your own shapes for tongue and ears. 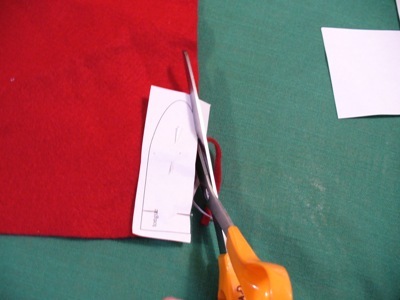 Use the pattern to cut out shapes from felt or other fabric of your choice. When cutting the ears, fole the material to double thicknes to make two ears that match. 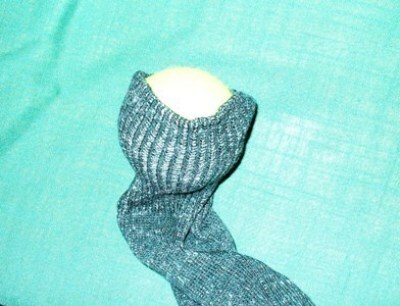 Put a tennis ball or a piece of thick cardboard inside your sock so that you will only sew through one thickness of the sock. 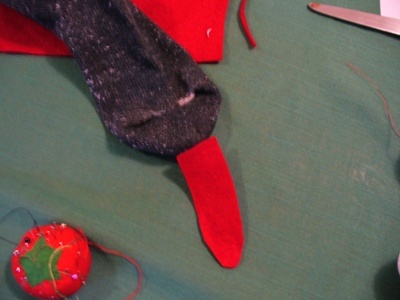 Pin the tongue onto the tip of the toe of the sock. 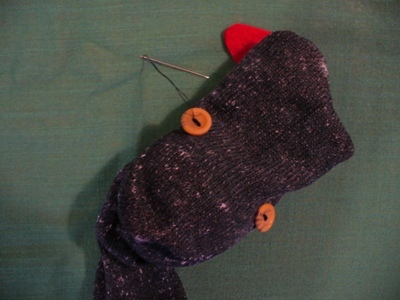 Sew the tongue to the tip of the toe of the sock. 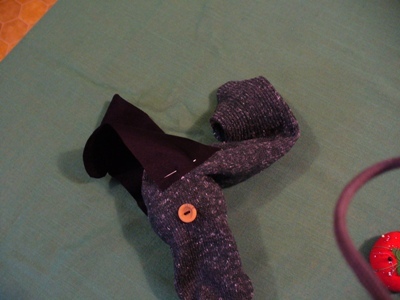 Overhand stitches work well. Be sure to start and end your stitches with knots that will keep your work form unraveling. 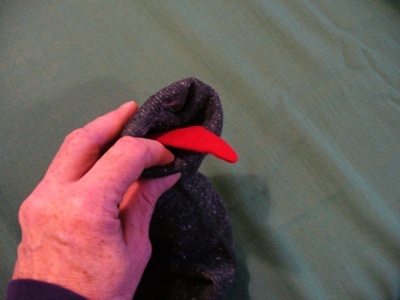 Push the tongue into the sock to form a mouth. Make marks with a marker or chalk where you want the eyes to go. Sew on button eyes. Using thread of a contrasting color can provide interesting detail. 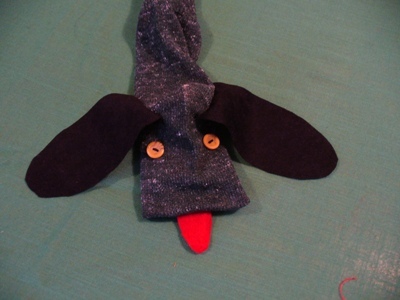 Pin on the ears so the outside surface is against the outside of the sock and the ears point upward. You might need to reposition the ears several times so they are symmetrical (both sides match). When you have them positioned the way you want them, sew on the ears. 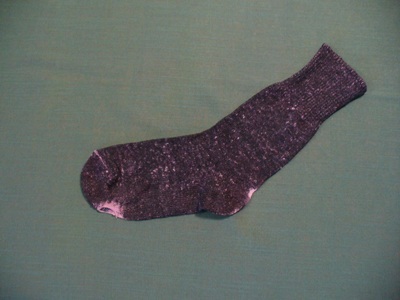 Be careful to sew through only one thickness of the sock. Use a running stitch at least 1/4 inch away from the edge of the ear. Ears that don't quite match are especially endearing. 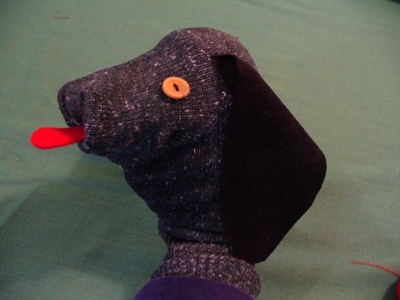 Remember: Puppy puppets, like people, do not have to be perfect to be wonderful. Take out the tennis ball or cardboard. If your puppet needs a bigger brain, try stuffing the area between the ears with another lonely sock, batting or other stuffing material. Now when you put it on your hand and talk to it, does it talk back? If not, try giving it a name. 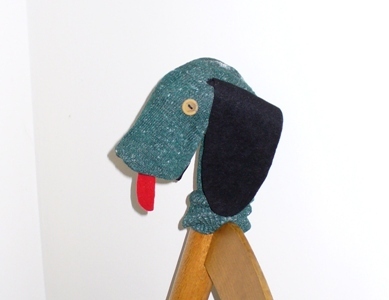 Some puppy puppets are shy. They can lick your cheek even before they learn to talk. They like to pant and flop their ears around for a while before they actually get up the courage to say anything. Sometimes you have to listen very carefully and be very patient. Sometimes at first they are more talkative with younger children or other pupper puppets. Many puppets like to have a special post from which they can view the world. This one, like Ruffles in Danger: Long Division, likes to whisper in the ear of the persons who sits in his chair.